1. Analyse the behaviour of any three significant items in the income statement for the period of six years. Discuss whether your organization’s performance relating to these items appears to be improving, deteriorating, or remaining stable over this period. 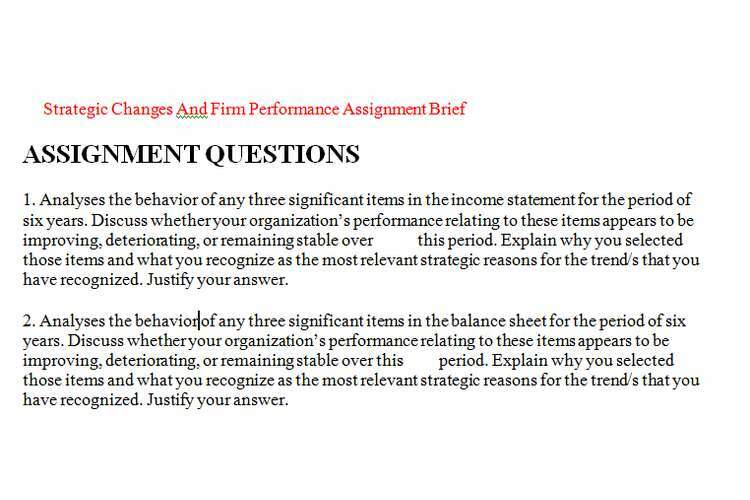 Explain why you selected those items and what you recognize as the most relevant strategic reasons for the trend/s that you have recognized. Justify your answer. 2. Analyse the behaviour of any three significant items in the balance sheet for the period of six years. Discuss whether your organization’s performance relating to these items appears to be improving, deteriorating, or remaining stable over this period. Explain why you selected those items and what you recognize as the most relevant strategic reasons for the trend/s that you have recognized. Justify your answer. 3. Analyse cash flow statements of the last six years and explain any three major changes which have occurred in relation to investing, financial management and/or operating activities of the business. Justify your answer. 5. Identify any two items not included in (or derived from) the financial statements that you think would be important to someone considering whether the organization is performing well. Discuss your reasons for believing that these two items about he company would be important in making an investment decision. answers to the given questions written in the body paragraphs, with appropriate headings, subheadings, etc. Use Microsoft Excel to perform the financial statement analysis. • Write as if you are a management advisor preparing advice for a client (who is the manager of the context company). • Give your report an adequate title and plan appropriate headings for easy reading – Consider your audience when construction your report. • The assignment must be prepared using a word processor on A4 paper. Make sure you choose a legible font face and size (e.g. Times New Roman 12 or Arial 11 would be sufficient) and double-spaced. • All graphs (highly recommended for this analysis) should be drawn with the aid of a suitable software tool or package and appropriately referenced. • Handwritten assignments will not be accepted.